It’s no wonder that Georgia is an agricultural powerhouse, considering the diverse topography and climate of its 10.1 million acres of farmland. This land covers 28 percent of the state and ranges from coast to mountains, making it ideal for the production of a variety of agricultural commodities. Food and fiber production and processing rank near the top of all goods and services produced in nearly two-thirds of Georgia’s 159 counties. Because of this, one in seven Georgians is employed in agriculture, forestry or related fields. 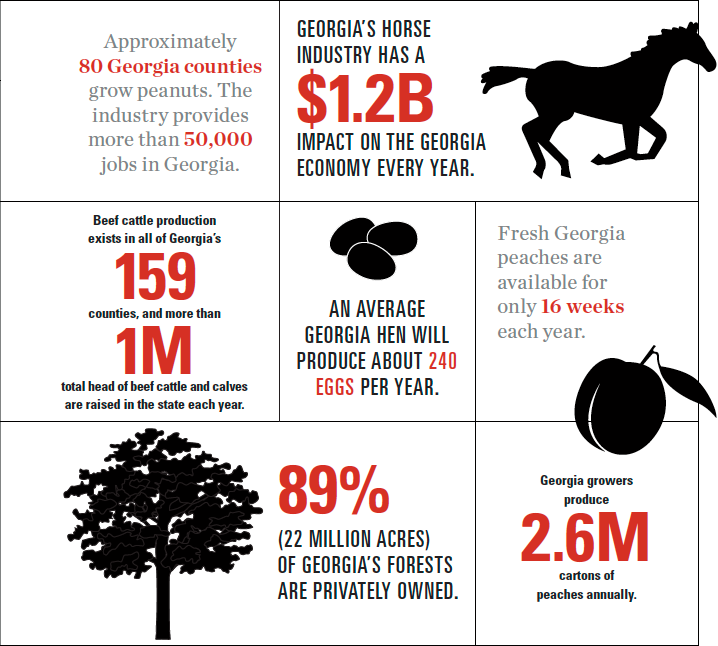 Georgia’s annual $13 billion farm gate value is composed of some top commodities, including broilers (chickens for meat), cotton, chicken eggs, vegetables and melons, peanuts and more. Georgia is the leading producer in the U.S. of both broilers and chicken eggs. Poultry and eggs contributed $5.4 billion to Georgia’s total farm gate value in 2011, and more than two-thirds of Georgia’s counties are involved in poultry production and processing. Dating all the way back to 1734, Georgia has a tradition of excellence with its No. 2 commodity, cotton, which was first planted for commercial use in Savannah. The state ranks second nationally in acreage and production. Despite Georgia’s “Peach State” name, the peanut is one of its biggest claims to fame, with more than 14,000 peanut farmers in the state. Producing 42 percent of the United States’ peanuts requires the hard work of 36,000 additional Georgians to process, ship and sell the peanuts. 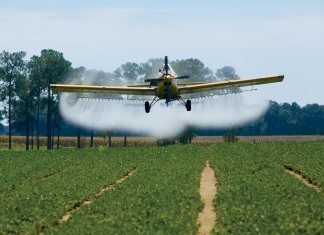 Although the state produces a number of diverse commodities, Georgia’s agriculture industry is focused on more than just crops. Farmers are working with new technology to increase conservation efforts, act as good stewards for the land and increase efficiency. Farm-to-table restaurants and agritourism are connecting consumers to the industry, while the state’s agricultural education is valued by students of all ages. Exports are another major part of Georgia agriculture. In 2011, Georgia exported more poultry than any other state, helping total U.S. exports increase by 19 percent. Other top exports include cotton, peanuts and wheat. The transportation of these commodities requires deepwater ports and inland barges, which employ more than 352,000 and contribute $66.9 billion to the economy. A major factor in Georgia’s economy, agriculture continues to contribute significant jobs and revenue to the state.